​Our house is built near a steep, inaccessible bluff overlooking the shores of Lake Michigan. Through out the years we explored all possible options to create a comfortable access to the beach, which would complement the surrounding environment and would give us the possibility of long-term use. About Nature, LLC came in as a highly recommended company and in 2012 they presented us with a very appealing, attractive and low impact, modular design. They developed the system and build a structure implementing their innovative technique, which allowed them to go through very wooded and difficult terrains we have on our bluff. The management and crew were very accommodating and professional and they completed the entire project in a timely manner without any destruction of the natural habitat. We are now enjoying our beautiful view in a new way and are looking forward to the use of our new stairs for many years to come. 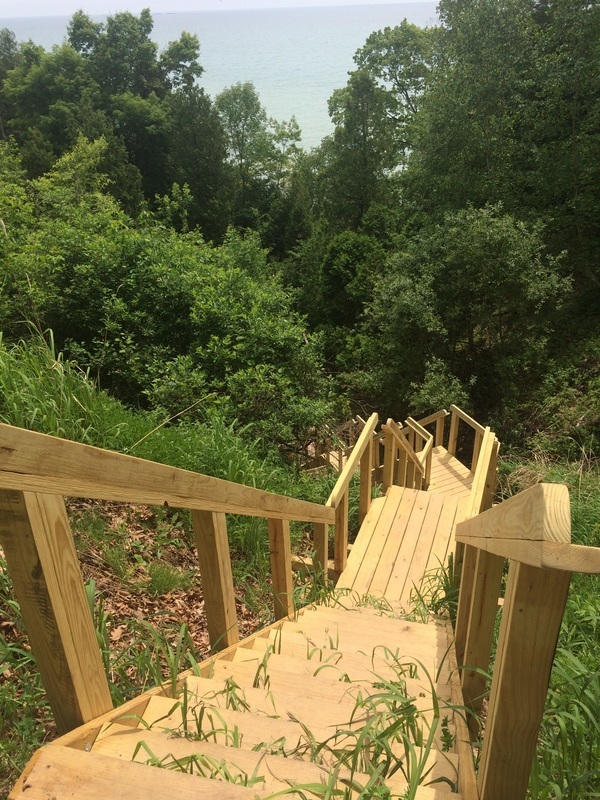 We contracted with About Nature, LLC in late 2013 to build beach access stairs on our Lake Michigan bluff. We wanted our system to provide easy and safe access (Accessible to both young children and senior citizens) from our home on top of the bluff to the beach below. In addition, it was important to us that the system was low maintenance, reliable for years to come, and would preserve the natural beauty of the area. About Nature delivered on all fronts. Construction was completed on time. The crew was professional and courteous. The innovative” floating and modular” design gives us comfort that our steps will perform if the terrain on the bluff changes. Not one tree was destroyed in the construction process. It’s been two years since the construction and our steps have required minimal maintenance. We, along with our friends and family, enjoy access to the beach all year round. Just a quick note, to let you know how our steps are doing. It’s been ten years since you put in the steps using your innovative method with cables that made me think of a method that would be used for a suspension bridge. As I’m sure I told you at the time, two other companies used their methods on the steps and because the bluff has erosion problems, their steps lasted only two or three years before nature took over and the steps slid down and broke up. It was nice meeting you in person at the site. The deck and stairs looked wonderful. It was great to see a new form of "technology" being used to help protect our shoreland bluff. Please use this email as a confirmation that your construction on the deck and stairs were inspected and approved by our office on November 16, 2016. We hired About Nature to build steps down our Lake Michigan bluff to the beach. Many of our neighbors have had poor results using traditional style steps due to the shifting nature of the land near the beach. About Nature’s solution has proved to be perfect for the challenges of our area. Andrej and his crew were hard working and skilled. They showed up when they said they would and finished the project on time and on budget. I would highly recommend About Nature and plan to hire them again. About Nature, LLC, Andrzej Sitarski, General Manager, constructed two decks at our home this summer, and we couldn't be happier. We have been residents of Port Washington living in our home for 29+ years. We are now retired and wanted these decks for the purpose of retirement enjoyment and ease of access. We have health and, especially, mobility issues. We needed safe, stable, level decks with room to build temporary ramps up into the home in the future should they become necessary. About Nature, LLC, gave us everything we wanted and much, much more. Our decks are so well designed, so well built, so comfortable, and They Are Beautiful (!) as well. We've had many, many positive remarks from family, friends, and strangers who happen by, too. From the initial contact with Mr. Sitarski of About Nature, through the design, bid, and construction process, our experience with this company has been Five Stars-Excellent. About Nature has performed at all times with absolute Care, Courtesy, and Professionalism. This is an example of their Care and Courtesy: In the process of obtaining a permit, we needed a Variance from the City related to the setback on our lot. Mr. Sitarski came and appeared before the Planning Commission with us as we answered questions and made our case. Needless to say, our Variance was granted. Additionally, Mr. Sitarski always kept us in the loop of information by email or personal phone call as we progressed through all aspects of this deck project. He would call before coming over to take or recheck measurements. He always informed us when his crew was coming in to work on the decks, approximate times, etc. That is Courtesy that can be hard to come by. This is an example of their Professionalism: At the completion of our decks, we still needed five special order balusters to complete the railings. They were on back order. Mr. Sitarski said he'd be over to install them as soon as they came in. True to his word, he came over as soon as the balusters were available--about ten days later--to install them. We appreciated that so much. This is a company you don't have to chase around when they need to come back for something small. The decks on our home are now complete, and we are beyond thrilled with the result. We enjoy our decks so much. They give us such pleasure. We have safe, level surfaces with increased room to move around and enjoy retirement activities outdoors. Our family visits comfortably, and we can relax outside in the warmth of good weather. Thank you, About Nature, LLC.